Barracuda Studios is proud to announce the release of three new 1/48 scale products in the BarracudaCast resin detail set line. These sets are up on the website now and available for order. These new sets are designed to upgrade the very good 1/48th Hasegawa Hawker Typhoon Mk. Ib series of kits. The external sets are designed for both Cardoor and Bubbletop variants, but the cockpit is designed specifically for the Bubbletop version. 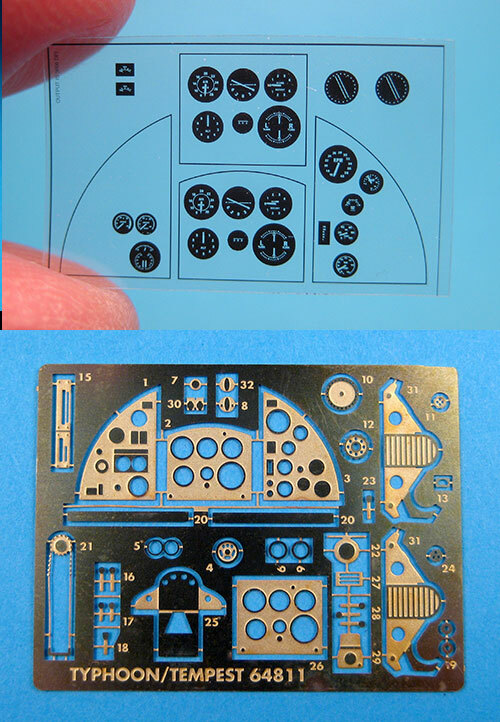 This thoroughly researched and super detailed cockpit set is designed for the 1/48th Hasegawa Bubbletop Typhoon kits. It consists of a complete resin cockpit with a photoetched instrument panel with very detailed, readable film dials and a number of other small etched details. The seat has a molded in Sutton Harness for ease of building. No major thinning or surgery is required to install this set. The parts may be modified to fit the Monogram kit. This set consists of a pair of accurate and detailed 5-slot mainwheels fitted to later production Cardoor and all Bubbletop Typhoons. The tires are smooth, and the wheel hubs are detailed down to the castellations in the axle nut. Also included is a detailed one piece tailwheel casting. Perfect for the 1/48 Hasegawa or Monogram Typhoon kits. I'd like to take this opportunity to wish all my friends and customers (current and future!) a very happy holiday season, and only good things in the new year.